Whenit comes to time on the water, Tiara understands what it takes to make the most of it, and the 50 Coupe shows the way. If you think about it, time is the most limited, most valuable resource any of us have. Regardless of what we do, our limited hours slip away. Best, then, to make the most of the time we’ve got, and that means making the most of our leisure. 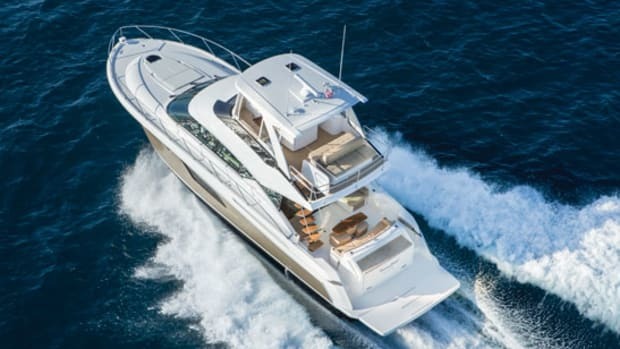 Time-strapped younger boat buyers these days want yachts topped up with comfortable seating and creature comforts, with wide-open interior designs and layouts that create inviting social settings. These desires prompted S2 Yachts—the parent company of Tiara and Pursuit—to create a new generation of sport yachts ranging from 31 to 58 feet that aims to mix modern styling with Tiara-quality construction and engineering. 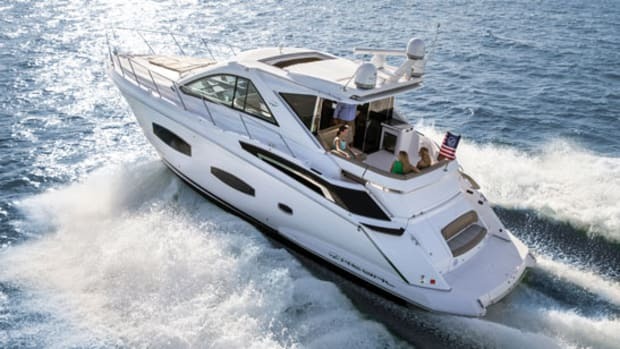 I had the chance to check out the Holland, Michigan-based builder’s first step in this initiative—the Tiara 50 Coupe, which made her first major boat-show appearance last month in Ft. Lauderdale. Home, yes. 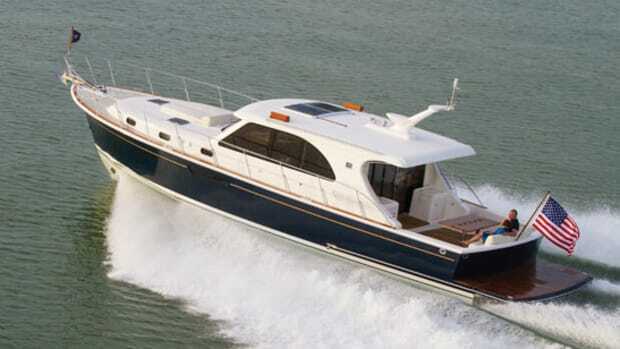 But the 50 is also a 35-knot sport yacht powered with Volvo Penta D11 diesels matched to the new IPS950 pods. Moreover, with her sloping lines and large hull-side windows, she has moved away from the more traditional Tiara profile you may find familiar. 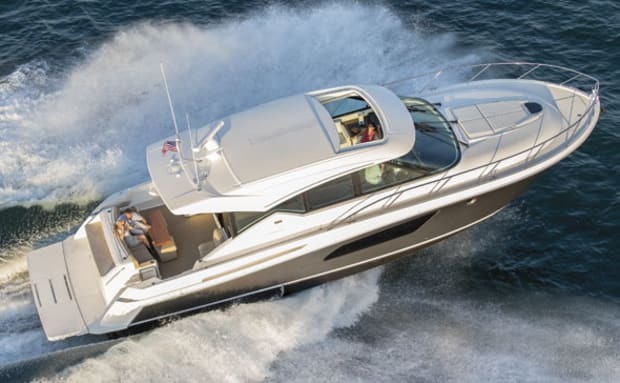 And she also has contemporary interior elements, such as modular settees and angular door handles, but holds onto brand-design characteristics like Tiara’s deck wings and swept sheer. “Yes, it’s a big change for us, but we have made sure that all those basic Tiara DNA elements are there so that the future customer is getting to experience a Tiara,” says S2 Yachts CEO Tom Slikkers, adding that the new Tiara look is based on feedback from customers. I saw plenty of signs throughout the 50 Coupe indicating that this new breed is good and ready to meet Tiara’s clientele. Some examples: a center galley open to the cockpit and saloon; flexible cockpit seating/stowage; a SureShade-powered cockpit awning; a forward berth that converts from split bunks to a single berth; a glass windshield, side windows and aft deckhouse doors that deliver 360-degree sightlines; and expansive hull-side windows that sandwich the master stateroom. I piloted the 50 Coupe from her starboard-side helm station. It was a good day for a sea trial—2- to 3-foot seas with consistent 12-knot winds. The 50 Coupe stepped onto plane with minimal bow rise. I never lost sight of the horizon while seated—a sign of a well-designed boat. The helm and companion dash’s gray surfaces cut down on the windshield glare—that’s another long-time characteristic of a Tiara. 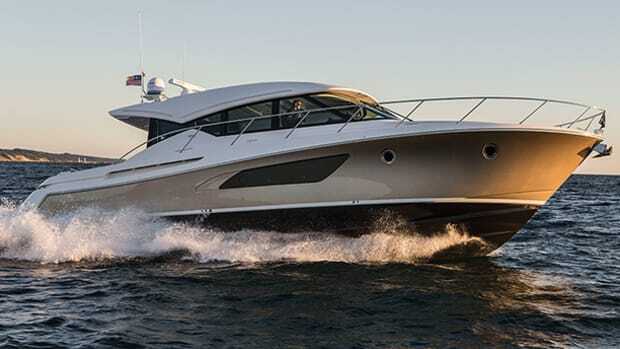 The 50 Coupe is the first North American production yacht with Volvo Penta’s Glass Cockpit. This integrated electronics system gathers all navigation, engine, and mechanical information, and delivers it to touchscreen displays ranging in size from 8 to 19 inches. 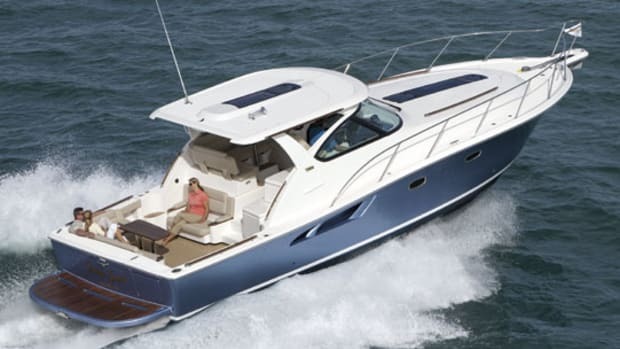 S2 worked with Garmin and Volvo Penta to create the system, and the 50 Coupe I tested was outfitted with twin 15-inch Garmin screens. The Glass Cockpit included Joystick Driving technology that allows joystick steering at high speeds as well as displacement and docking speeds. You still control speed with the throttles. Steering at planing speeds requires only slight nudges of the joystick. It takes a little getting used to, but could come in handy for longer periods at the helm, thanks to its comfy positioning. Jackshafts link the amidships engines to the pod drives. The installation places the center of gravity low and forward for ride quality. Visibility ranks right up there with the best I’ve seen. 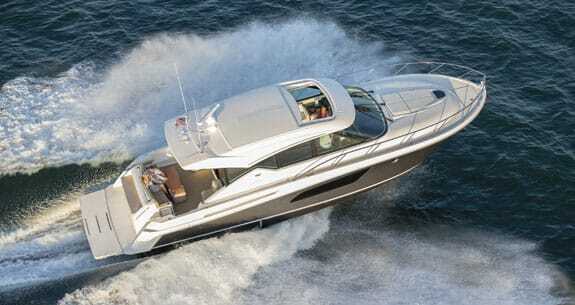 At 26 knots, the boat gets 0.5 nautical miles to the gallon. In fact, that number pops up throughout the cruising range. I heard no rattling or clanking or other noises as we trounced through the Lake Michigan slop, indicating tight construction practices—a solid and stiff boat. 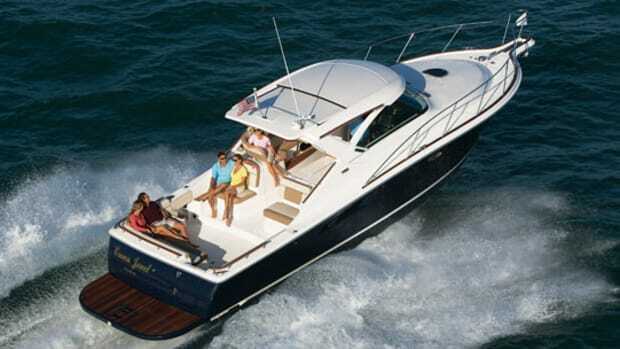 And it should be since Tiara hand-lays the 50 with a fiberglass bottom and balsa-cored sides and decks. The company uses vinylester resin in the skincoat for osmotic-blister protection followed with a high-grade polyester. The builder also makes use of resin infusion technology to construct the hardtop, and employs Resin Transfer Mold technology for the hatches, doors, and other small parts. “Ply-foam,” a combination of wood and foam in fiberglass sandwich construction, is used to build the stringers. Often a builder’s overall level of fit and finish in one area of the boat will hold true for the entire vessel. On the Tiara, I checked out a cockpit sole hatch and the locker underneath. Thick rubber gasketing rimmed the lid’s underside, and two stainless gas lifts raised the lid and held it wide open. A deep gutter around the perimeter guides water to a scupper that’s flush with the surface to avoid puddling. Three fenders sat neatly inside, with a stainless bar and composite panels holding them snugly in place. I found no rough edges of fiberglass or unfinished hatches on the 50 no matter where I looked—on deck, in the saloon, or below. The yacht can be ordered with two or three staterooms and crew’s quarters. 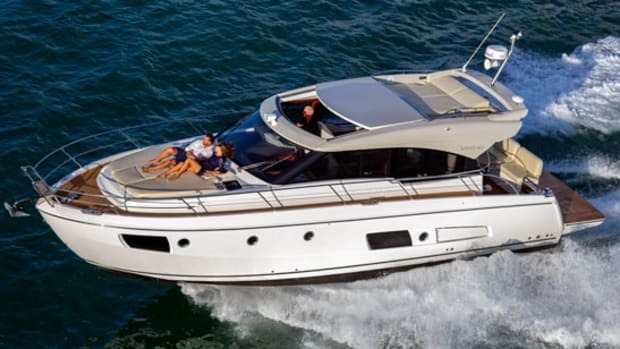 In both cases, Tiara makes the lower deck’s amidships sector the home for a full-beam master stateroom with private head and long hull-side windows. Circular portlights are built inside those windows for ventilation. There’s also a comfortable settee on the starboard side across from the berth. With the sliding glass doors open, the cockpit, galley, saloon, and helmdeck are all connected. Moving forward from the cockpit, you step into a full galley. A seating area with dining/coffee table fills the port side of the saloon with a 40-inch LCD TV and entertainment center opposite. The companion seat can face forward or aft. Overhead, the hardtop sunroof opens and two skylights on the companion dash direct light into the cabin. 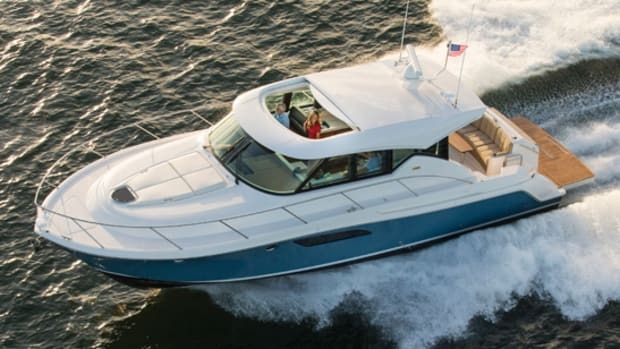 After spending several hours on the boat and with company executives, I believe the 50 Coupe is a Tiara for the ages, the next step for some loyal owners, and a beacon to the brand for boaters. But it’s the hours and hours that the buyers will spend onboard where the real value will show itself. 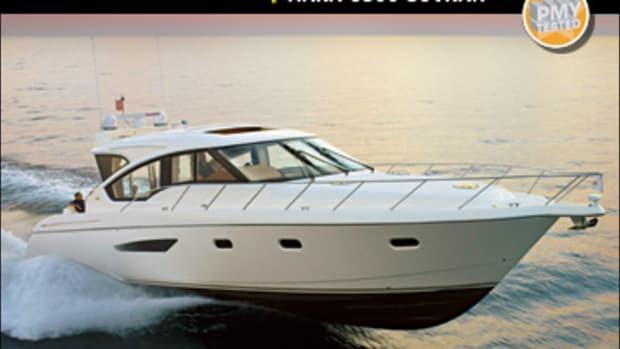 Noteworthy Options: Walnut cabin sole ($10,940); Nautical Structures hydraulic swim platform ($58,100); SureShade aft sunshade ($13,320); Volvo Joystick Plus cockpit station ($17,860). 654 gal. fuel, 200 gal. water, 4 persons, 150 lb. gear.